Caroline. I'm seven, and my favorite ice cream is mint chocolate chip or cookie dough. SUNNY SWEET IS SO NOT SORRY. My mom brought it home for me. My favorite part was when they had to shave Masha's head to get the flowers off. If I woke up with flowers glued to my head, I would come downstairs and tell my mom and then I would try to pull them out. It's really cool and I want you to read it because you'll love it. It's pretty and I think it's funny that Sunny is hiding the glue behind her back. Yes. Because I really liked the book and I want to read SUNNY SWEET IS SO DEAD MEAT the very first day it comes out. I would ask whether she has a little sister and if she's just like Sunny. I have two little sisters and one big sister. Sunny is a mix of all three. My big sister was evil. My little sister was a genius. And my baby sister was the cutest thing in the entire world. I mixed them all together and created Sunny. Here is a picture of the four of us. I'm the one in the horrible green jumper! 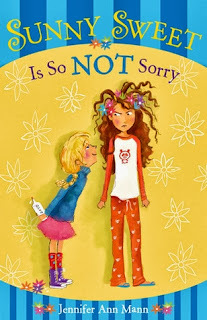 Thank you, Caroline, for sharing Sunny Sweet Is So Not Sorry with The Kidliterati!